Tonsai is one of those backpacker havens where you can spend days on end just relaxing and living life at a slow pace, and that’s what I found myself doing for 8 nights! It’s essentially a mixture of rock climbers, hippies and laid back travellers, a good place to either go climbing crazy or just chill, and I found myself doing the latter. I did actually have plans to do some climbing but lets just say a hammock rope snapping and a two foot fall straight down onto my hip put an end to those. 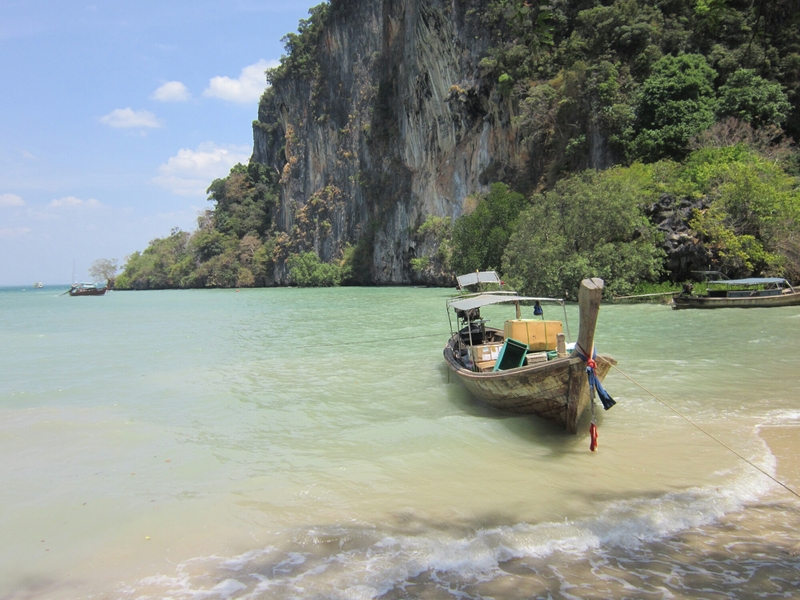 Tonsai itself is one of 4 beaches in the Krabi area that can only be reached by boat, so it does have an island feel to it. 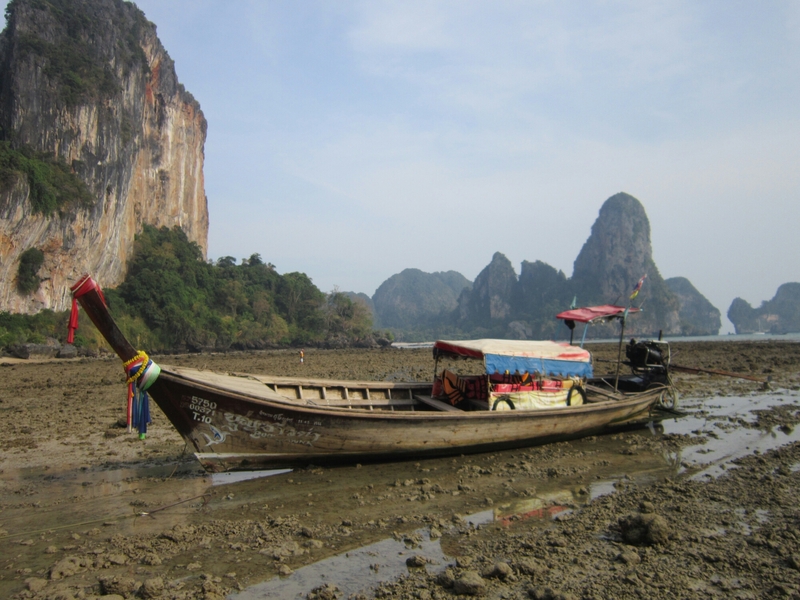 I had stayed the night in Krabi town, so to reach Tonsai I took a Songtaew for 50 Baht to Ao Nang pier and then a longtail boat for 100 baht for what was a 10 to 15 minute ride. I was then dropped on the beach in the water which came up to my knees. The beach has a tide that goes in and out pretty quickly, and when out it goes pretty far! I quite enjoyed exploring the beach when the tide was out, it is very rocky and you can see a lot of crabs, fish and so forth. Plus the boats look pretty cool! Tonsai village is behind the beach up in the jungle. Essentially the area right behind the beach is jungle to, and there is this Berlin like wall, then Tonsai village behind that. From what I understand more of the village used to be on the beach front but the land was bought by people intending to build a resort. Well the resort hasn’t been built and I was unable to figure out if it will be. 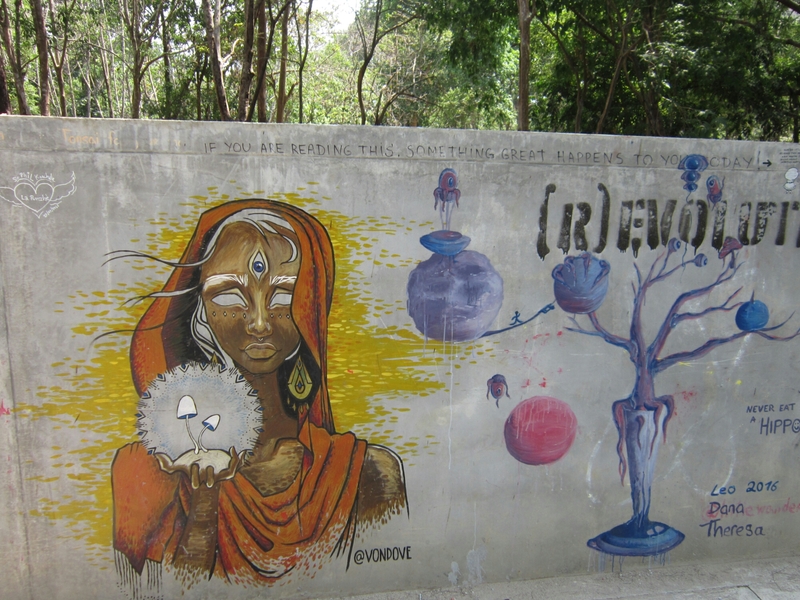 The one upshot though is that there is now some awesome street art on the wall! I stayed in a bungalow for 250 baht a night. It was very basic but all I needed! There was no wifi so trips to the bars or restaurants were required for that purpose! 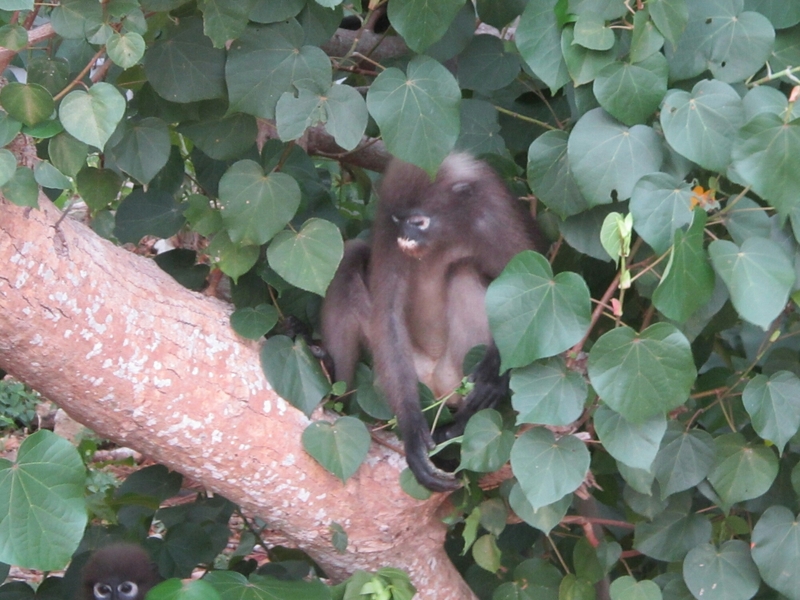 The best thing about staying in the jungle was the monkeys! They frequently could be seen in and around the village. There was 3 different types, my favourite being the Spectacled Leaf Monkey! These guys and girls just eat leaves, whereas the others pretty much eat anything, rummaging through bins and rampaging through and over Bungalow sites! 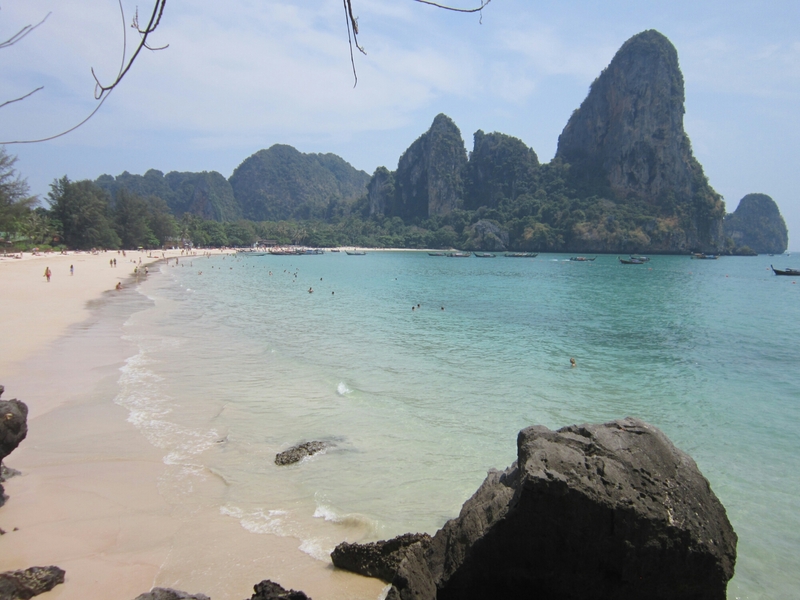 From Tonsai you can walk to West Railay beach, from which East Railay and then Phranang beaches can be reached. These are the more ‘typical’ holiday maker destinations and were a lot more full. There are 2 routes from Tonsai. One is a path through the Jungle, which I really liked as it was quite and you could see lizards, butterfly’s and the occasional monkey in the trees. I even spotted one of the large Monitor Lizards! The other path is up and over the rocks that separate the 2 beaches. At low tide you can actually just cross over the rocks that divide the 2 beaches, otherwise their is a path up above. At high tide this does require wading through some water. 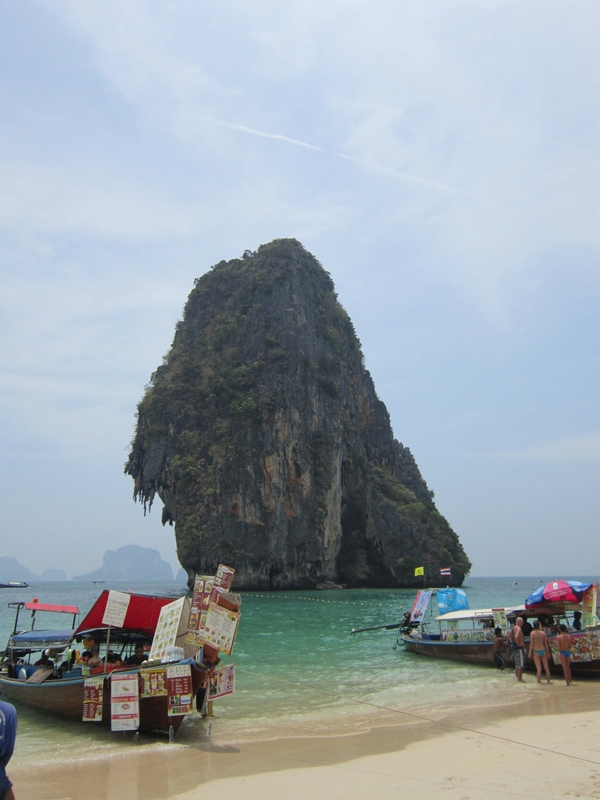 West Railay and Phranang beaches are the ones with an abundance of sunbathers. Which isn’t surprising as they are very nice beaches with beautiful surroundings! East Railay you can’t sunbathe as it’s essentially a path which the water comes up to at high tide and at low tide it isn’t a sand beach. It is home to Mangrove tree’s and I thought it was quite pretty. 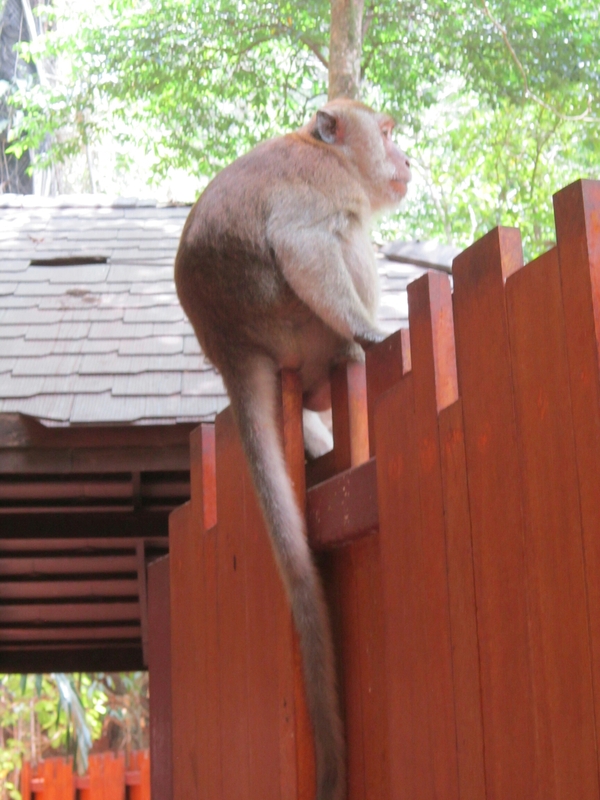 The path from East Railay to Phranang Cave beach is a good place to spot monkeys! 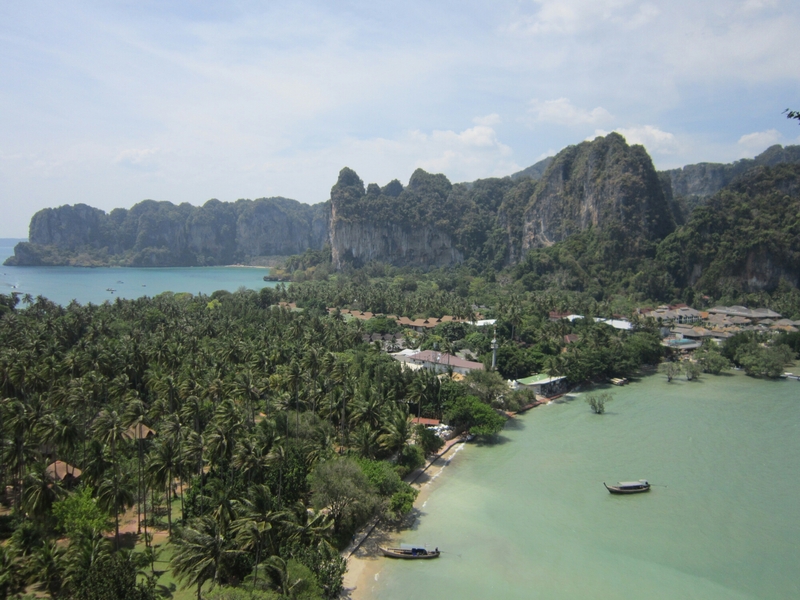 From that path you can also climb up to a viewpoint where you can see an amazing view, taking in East Railay beach and the area between it and West Railay and also Tonsai in the distance. The path up is a real scramble and there are ropes to help. There is also a lagoon but unfortunately you need to use ropes to get down to it and my back injury prevented me doing this. But still, the viewpoint was worth it! This looks amazing! Your post makes me want to go back to Thailand already! Very Interesting and like the pictures with your posts Dave!